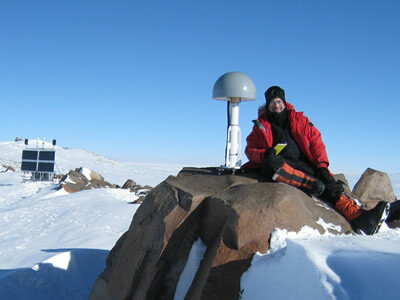 Seven continuous GPS stations were installed in Antarctica during the 2009/10 field campaign. 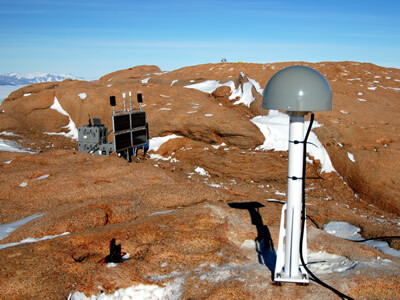 It was not possible to install all 14 CGPS because of inclement weather in West Antarctica. Thirteen stations installed during the previous two seasons were visited to upgrade them to the latest designs and configurations and in several cases to repair and upgrade the sites. Data from these sites are transmitted via an Iridium modem to the Boulder Facility network, where it is archived automatically. Currently there are 31 stations in the Polenet network. Figure 1 - Mount Carbone CGPS station. Figure 2 - Eric Kendrick next to the GPS antenna with the power system in the background at Mt. Howe, the southern most CGPS site located on bedrock in the world.